﻿ Best Price on Sleeping Giant Rainforest Lodge in Good Living Camp + Reviews! Amid the forests of the Blue Hole National Park, this property offers free Wi-Fi access, private parking and free bike rentals to sightsee the area. A tour desk is also available on site. 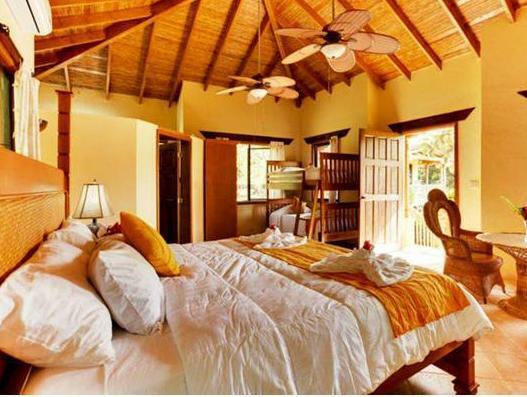 Sleeping Giant Rainforest Lodge’s accommodations are air conditioned, offer wardrobes and private bathrooms with showers. The chalet also has a dining area and a terrace. The Creek Side Lounge serves early morning coffee services, late dining courses and all food is home-cooked. It is located in the third floor of the establishment. The Sleeping Giant Rainforest Lodge offers panoramic views of the rural landscape, and is surrounded by a creek, rivers and forests. The use of kayaks is free of charge. Belize City is 1 hour and 30 minutes’ drive away and the Tapir Mountain Nature Reserve can be reached after a 70-minute drive. Philip S.W. Goldson International Airport is 1 hour and 40 minutes’ drive from the lodge.